Wilbur and Orville Wright achieved the first successful airplane flights on December 17, 1903 at this site. 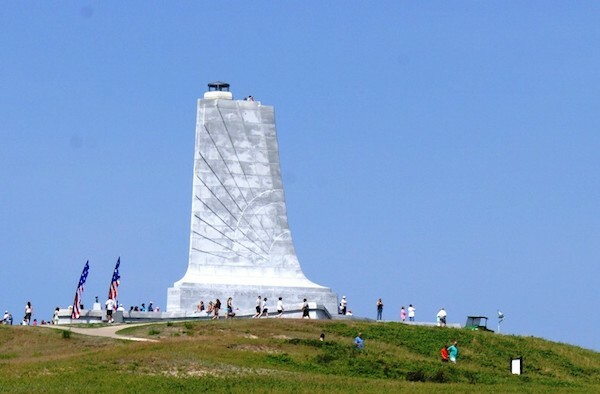 You can take flight here too, at this National Memorial site in Kill Devil Hills, which has numerous paths and roads that make for a unique and historic run. There are some good running options around here. We’ve mapped a ~5 mile run incorporating the paths around the Memorial site, and a jaunt along Colington Creek. Start at the Park Visitor Center (under construction as of March 2018), and run along the walkway path to the Memorial. You’ll see a plaque, the original plane, sculpture, and reconstructed Hangar. Run around the Memorial pathways, which is a total of ~3 miles. For an additional 2 miles, run along Colington Rd. west along the Creek and over the bridge, turning around at Billy’s Seafood (past here, the road has no shoulder/sidewalk). Return, retracing your steps, using Colington Rd. (which has a path alongside the road), back to Wright Memorial Rd. Another option from the Memorial is to take W. 1st St. north, to Bay Dr., for up to 3 miles. Pleasant residential area, with some shade and good bay views. Add-Ons: The beach is 1.5 miles east of the Memorial and is great for running. The stretch of Highway 12 in this area isn’t particularly nice for running.